Smoother action positive seal mechanism. All Pemko automatic door bottoms consist of an aluminum case which surrounds a movable drop-bar seal. 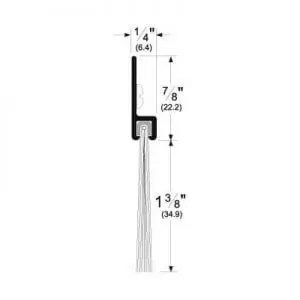 The drop-bar seal is actuated by a plunger which contacts the jamb as the door is closing, forcing the drop-bar seal down against the floor / threshold. 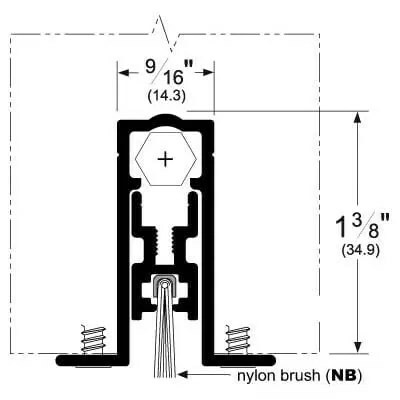 Most models are now available with nylon brush (NB) seals. The nylon filaments conform extremely well to irregular surfaces such as carpet, stone and grout lines. Especially over uneven surfaces, both PemkoPrene® (PK) and nylon brush (NB) provide excellent seals to keep out draft, dust, moisture, insects, fumes, light, and sound. All models are non-handed and reversible. Installation is fast and easy because disassembly is not required to change handing: simply flip the automatic door bottom and you’ve reversed the hand. The clean symmetrical square-shaped case design also provides for even flush mounting. The line includes models which can be mounted to either wood or hollow metal doors. End plates are provided for all mounting applications. All Pemko automatic door bottoms seal up to a 3/4″ gap under the door except PDB-series, 420, and residential models which seal 1/2” maximum. Available in any size ranging from 24″ to 48″. Lead line available upon request; consult Customer Service for options on profiles. 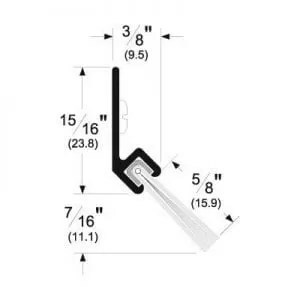 The drop-bar seal actuation mechanism (all models) causes the drop-bar seal to always actuate on the hinge side first. 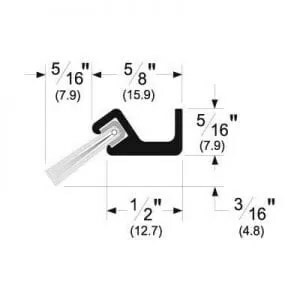 This feature prevents the seal from skidding along the floor / threshold while the door is being closed. Door hang up will not occur. All Pemko automatic door bottoms are provided NET length. 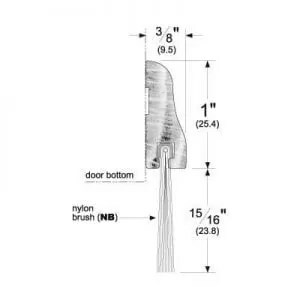 This automatic door bottom is supplied with a Nylon Brush (“NB”) insert – item number P516041. Smoke Tested – UL1784 – tested in accordance with UL 1784-2001 Air Leakage Tests of Door Assemblies, and meet the performance criteria for allowable air leakage as specified in NFPA 105-99 Installation of Smoke Control Door Assemblies. Meets the requirements for category H – Smoke Seals.